It may sound unlikely, but this aerial ballet performed by trained birds of prey to Wagner’s Venusberg music was both powerful and chilling, doubtless helped by the visual resonances from the arena design. Recorded classical music is an integral part of the family oriented spectacles at the Puy du Fou near Nantes, France; the superb reproduced sound at the outdoor performances left me thinking that Jonathan Harvey was on the right track when he suggested that, in certain circumstances, classical music should be amplified, and that Jeff Harrington also had a good point when he said we need to turn up the bass. 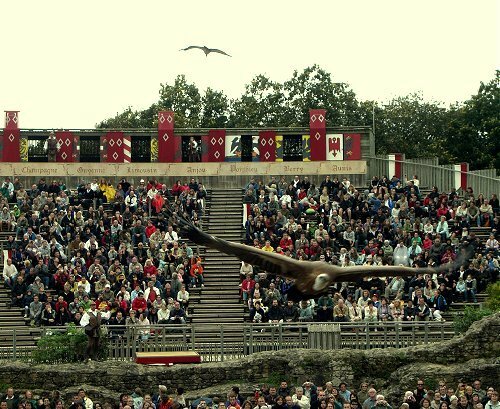 Les Orgues de Feu, another of the spectacles at the Puy du Fou, follows the overgrown path of seeing the music. The result is a typically Gallic mix of the genuinely inspired and totally naff. See for yourself below while I continue on my travels. This sounds amazing, though I have difficulty imagining it really - a ballet of birds of prey? Set to Wagner? Interestingly, there is a forest just outside my house where Wagner used to walk. In the early 1850s he copied down some of the bird song, attempting to transcribe into musical notation. Whe Siegried listens to the birdsong, and discovers he can understand it, the actually music is based on the birdsong in the forest just outside my house. So, there is something with Wagner and the birds.